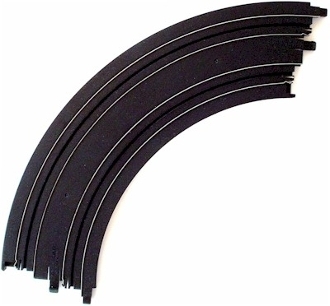 Expand and add to the excitement of your HO Scale Marchon MR1 Racing Set with extra track! What does 9” radius ¼ circle curve mean? If four ¼ curve sections are attached together; they will form a full circle with a 9 inch radius. The radius of a circle is half the diameter. The diameter is a straight line connecting the outer boundary. A straight line connecting two opposite points on the outer boundary of the circle made from connecting the four 9 inch radius ¼ circle curve sections together will measure 18 inches (9 x 2). So, the 9 inch radius description has nothing to do with the actual running length of curved track sections. To calculate the actual running length of curved track sections, a high school geometry mathematics text book will be needed.